In Luke 8, Jesus is recorded telling a story about a farmer planting seeds. The seed, which he explains represents God’s word, falls in all kinds of places, each with different results. Only one place yields an abundance of lasting fruit. Jesus doesn’t tell the farmer to be a better farmer. He tells them to be dirt, and not just any dirt, because there are all kinds. Only one kind of dirt bears lasting fruit. What are the distinguishing characters of this good dirt? It listens and holds on to the word of God with an honest and good heart. This annual report provides a brief summary of life on the urban farm of the South Bronx. Like Jesus’s parable, through living in, loving and serving the community, the seed of God’s word has been spread. Like Jesus’s parable, seeds have fallen on the path, in the rocks, among thorns, and on good dirt. Like Jesus’s parable, although a farmer can see the results, he or she can’t control the quality of the dirt in others’ lives. All the farmers can do is be the dirtiest dirt dirt can be! 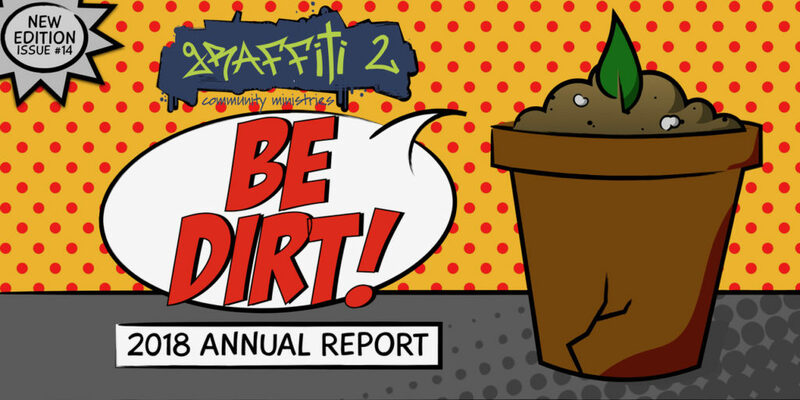 On behalf of the Board of Directors and staff of Graffiti 2 Community Ministries, thank you for supporting this dirt. We pray we will only get dirtier as we listen and hold on to the word of God, endure, and of course, keep on planting.